Unveiled yesterday, the Microsoft Lumia 650 is an odd little duck in the Windows 10 Mobile ecosystem. Packed with some entry-level specs (the Snapdragon 212 SoC is under the hood), Microsoft reportedly produced the phone for business users. That is why it comes pre-installed with Microsoft Office apps. Even though the device is coming to pre-paid carrier Cricket Wireless, as we told you yesterday, Microsoft sees the Lumia 650 as a cheap handset for companies to hand out to employees. As we said, the Lumia 650 is odd. Why design a phone for the enterprise without including one of the best pro business features that you offer? 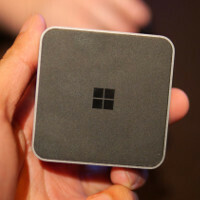 For Microsoft that would be Continuum. On the Microsoft Lumia 950 and Microsoft Lumia 950 XL, this feature allows the user to turn the phone into a makeshift computer using USB cables and the Display Dock. You can plug in a mouse, a monitor and a keyboard, and let the phone power the portable computer set-up. The reason why Continuum doesn't work with the Lumia 650 revolves around the minimum specs required to run the feature. According to Microsoft, a phone must be powered by one of three chipsets to use Continuum. Those three are the Snapdragon 617, Snapdragon 808 or Snapdragon 810. It also has to sport a minimum 2GB of RAM. These minimum requirements obviously eliminate the Lumia 650. Of course, the next question is why did Microsoft not beef up the specs on the Lumia 650 so that it could support Continuum? The answer is rather simple. Microsoft makes phones covering numerous price points. The Lumia 650 is supposed to be cheap for businesses to buy and use. At its price point, it does contain several business features including Office, One Drive and Cortana capabilities. As one Microsoft spokesman says, if you want the Continuum feature, go buy the Lumia 950 or Lumia 950 XL. MIA "Missing In Action" ? anyway, this was expected, I mean why give your best features to something that won't generate enough revenue? Because that is how you get market share. You can only push the premium with arm twisting tactics like that if you have your users at gun point via lock ins like Apple does. There is no chance that MS can do the same and hope to get back into the mobile game. You have to offer them something far and above the competition to get them to take the pains to switch. Otherwise, you aren't going to change any hearts and minds. If they upped the specs to handle continuum then they'd also up the price. They clearly didn't want to go that route with this phone. Buying a phone in this price bracket and then the continuum dock would increase your cost by 50%. How about android phones cheaper and better hardware I am sure its doable. Add extra ram and older but powerful cpu. They look quite delusional in they tactics because they cannot dictate market at all and so the price. As comment above they have to give a lot more than competition however i think they already lost momentum its only a miracle that can save mobile division. This phone isn't even out yet. The quality of the screen might be good for it's price. Same with the build quality of the body. If specs are all you want then there are definitely some Android phone out there for the money that meet that for cheap. Lets not forget that most of those phones will never get the next Android OS or updates past 1 year. Android also requires that extra computing power to run smooth to begin with. OS updates aren't exactly MS's selling point on mobile, just ask their loyal shafted fans. Yet even with regular updates, they have to offer something more than just a different OS and smaller ecosystem. There is no benefit in getting a 650 especially with specs that makes it outdated on release. well, they will anyway loose money on mobile buisness, and they will lose with this one (no one will buy ut) and probably they will lose whole and that whole buisniss at the and, too. so if they want to fight to keep stay in it, and take some share, they do must go with beter devices with lower prices than competition. anyways....they should produce devices without any profit, if Motorola can do it, MS could do it also. All price points? There is a pretty huge gap between the $200 Lumia 650 and the $550 Lumia 950. Do you know that they aren't about to release a new mid-range phone? Too bad. Continuum is WP (or Win10Mo or whatever)'s standout feature, and low-end is WP's standout market (see the solid, popular, dirt-cheap Lumia 520). It's a shame we can't see what they can do together.